These can be ready within 30 minutes! You wake up, crave pancakes, and bam! Before you know it, they’re on your plate! Drop 1/3c of batter into a warm, oiled frying pan, cook for about 3 min on the first side, flip, and let cook for one extra minute. Repeat. Enjoy. 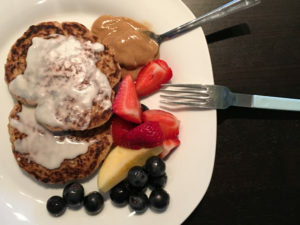 As inspired and adapted from the Healthy Maven’s fluffiest oatmeal chocolate chips pancakes. Previous Post The best vegan meatballs everrrr! Delicious. My new favorite breakfast. I eat them with butter on the top, applesauce on the side, sometimes with maple syrup and……with an egg, with orange juice, coffee. Lovely change. Thank you for the inspiration!